If you loved Berlin for all its disheveled and raw charm and have been told countless times “this ain’t the real Germany”, consider yourself in luck, as there is another little slice of imperfect paradise waiting to be discovered less than 200km away! Leipzig is neither the Germany these people are referring to — and you will love it. In fact, if you are not a big fan of big bustling cities, you may love Leipzig even more than Berlin. Beware that the main means of transportation in Leipzig, the tram, is not covered by Google maps for some strange reasons. Download the Easy Go app to make commuting a lot easier, or grab a bike, as the city isn’t that big at all. 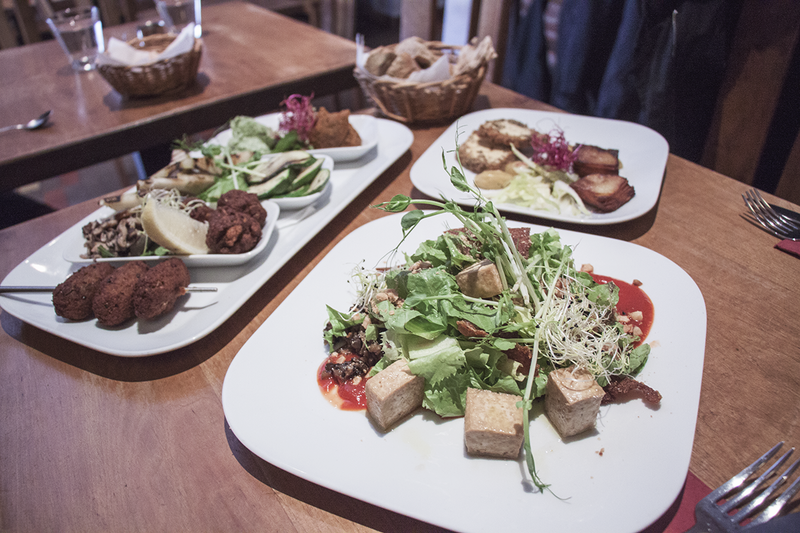 And for such a small city, Leipzig has a lot of vegan options to pick from, which made me love it all the more! It can be a little overwhelming to cram all this into just a few days, so it’s good to know that trip planner websites exist to make the best out of your time. 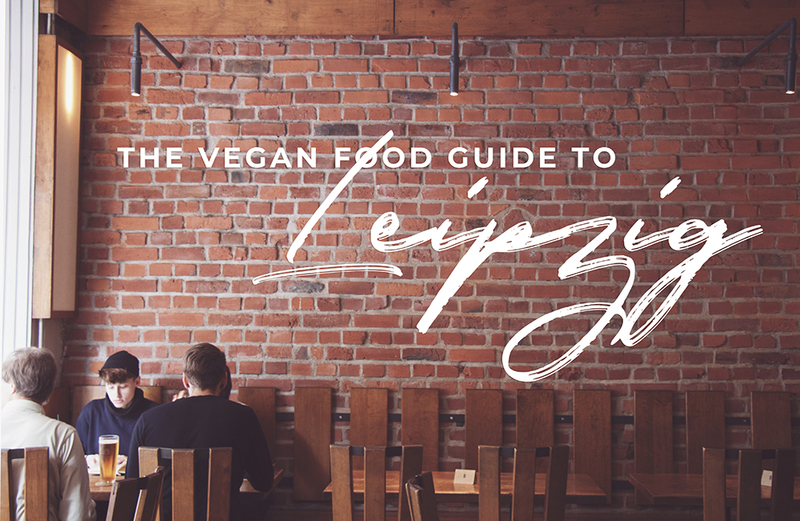 Below are my top recommendations for vegan grubs in the wonderful city of Leipzig. 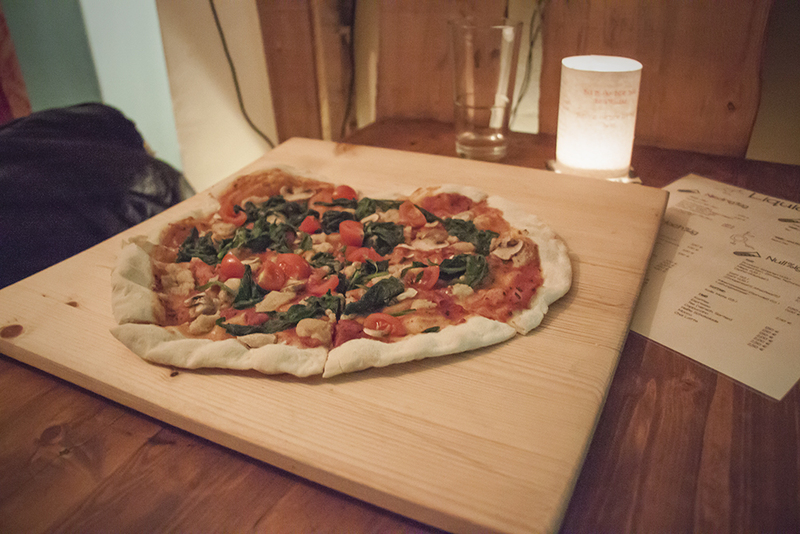 Symbiose is a super cute and cozy restaurant that offers a fully organic menu of healthy vegan fares. I had the vegan cheese platter and pancakes for breakfast and it was amazing, except for the coffee which was quite meh. I think it was hands down one of the best renditions of vegan cheese I’ve ever had. 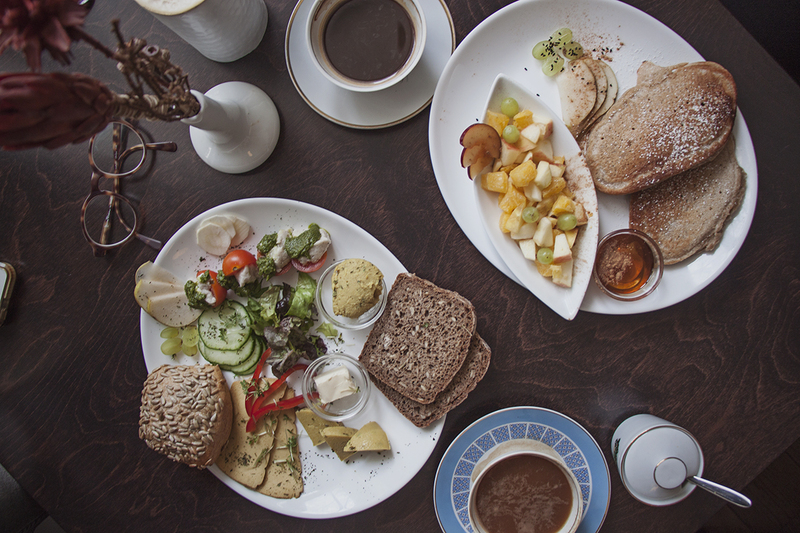 Other menu items include salad, quiche, sweet potato strudel, burger, and a bunch of vegan cakes, natürlich. 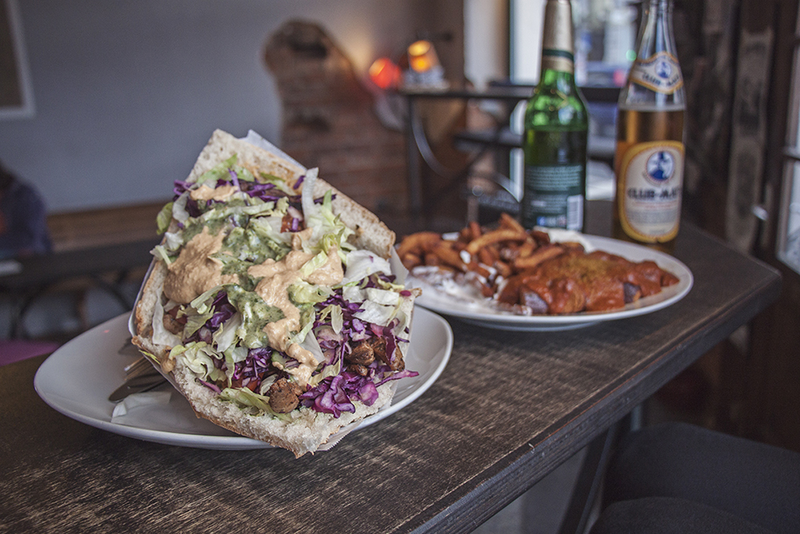 Cheap beer, cool grungy interior, sick music, alternative vibe and amazing vegan greasy food to help you get over yesterday’s hangover — that’s Vleischerei for ya. The portions are freakishly huge, so it’s worth coming with a buddy to be able to sample a few things. Try the iconic currywurst — a vegan sausage grilled and doused in curry ketchup and served with an artery-clogging portion of crispy fries and all sort of sauces you care to have as an add-on — I suggest you go all out and try the garlic aioli if you were not planning to kiss anyone that day. The gyros is also amazing and humongous but good luck trying to put your lips around it. This is a quality greasy spoon that I will continue fantasizing about for a long time! UPDATE: Unfortunately Vegele has closed. Super relaxed cafe with teeny tiny seating area. They also do takeaway and delivery by cargo bike. The food is all raw vegan, regional and seasonal, and there’s a selection of juices and smoothies also. The short menu contains salads, soups and also some sweets. Everything is super beautiful! 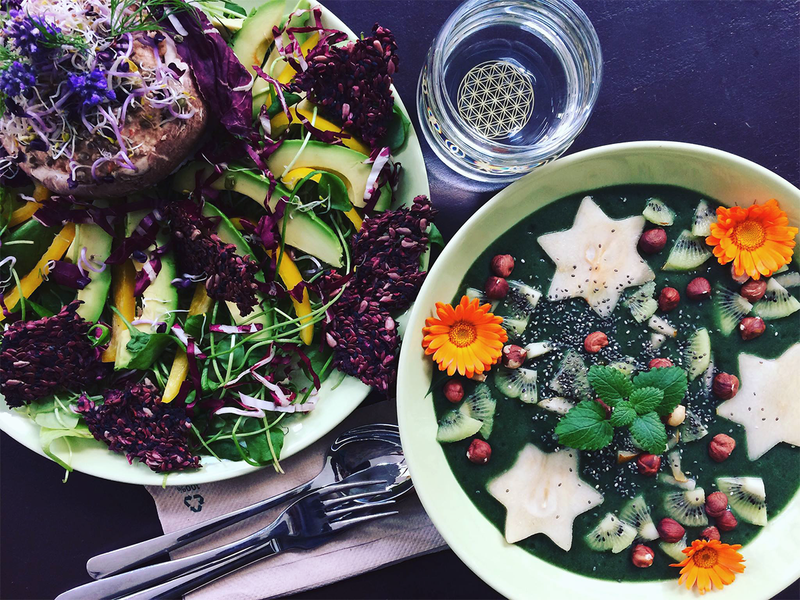 Vegele’s aim is to bring more awareness to health and the environment through “food activism” and they also offer a bunch of workshops on veganism, raw veganism and detoxing. Super nice! 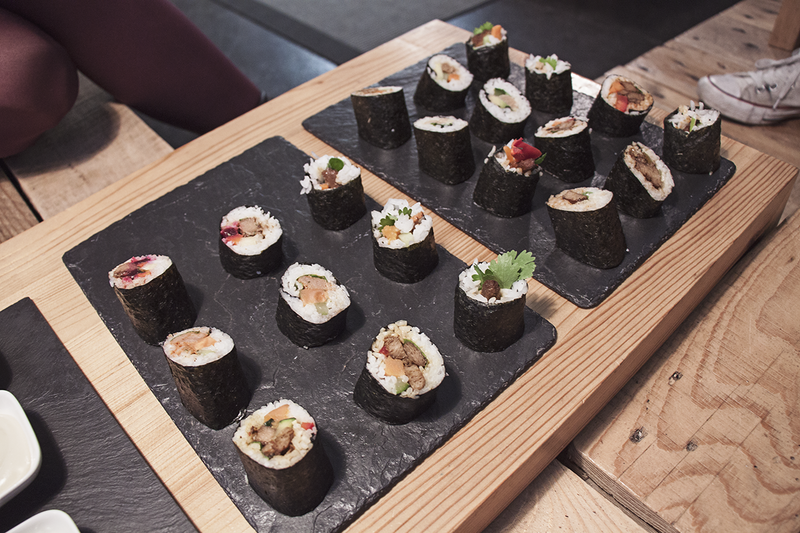 Serving vegan and vegetarian sushi with a twist, vVasabi is probably best for take-out as the seating area is minuscule. If you’re not a traditional sushi lover such as myself, you will love vVasabi, but the goulash sushi, nougat sushi, gyros sushi and company all took me a bit off guard quite frankly. It was really good though! Just not what I expected and maybe a bit too creative for something that is already perfect in its original traditional state. Call me boring? There’s a nice selection of green smoothie to pick from also, so all of it is super healthy. vVasabi is super creative, I’ll give them that! Zest might be the fanciest veg restaurant in Leipzig, and it is so totally worth the splurge in my opinion. There is some dairy on the menu, but all of it is clearly labeled. Great food, great wine selection, and great interior all make for a superb experience. It’s a bit on the pricey side, but again, that’s something you’d expect for food so expertly prepared with such quality ingredients. Real special. 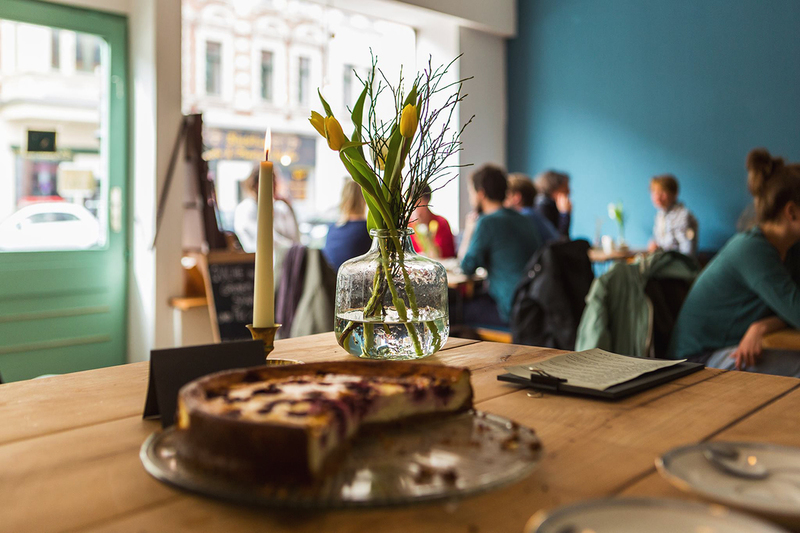 Cafe Kater was my favorite place to work, sip on delicious coffee and eat vegan cake in Leipzig in a lovely and cozy, if a little hipster-y atmosphere. It can get pretty crowded in there, so either arrive early or be ready to have to wait for a seat. 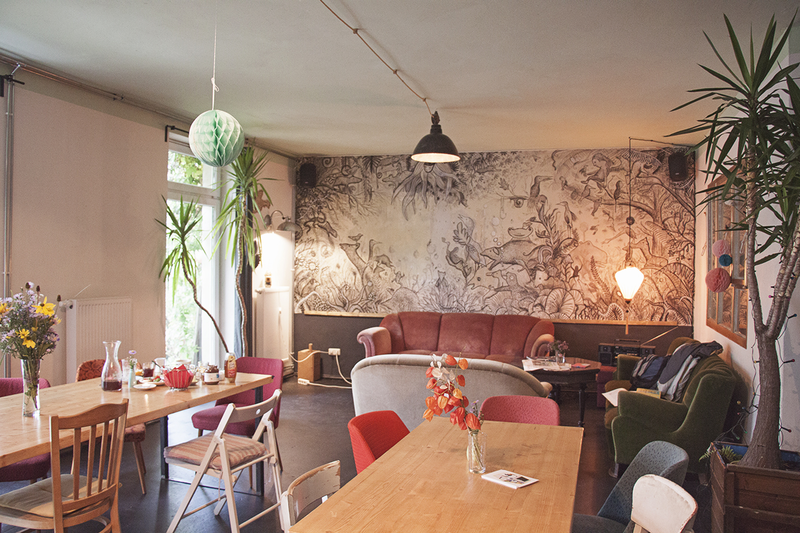 Located in the artsy neighborhood of Lindenau, this is also where I stayed, ate most of my food and did most of my activities. A great place to start the day! 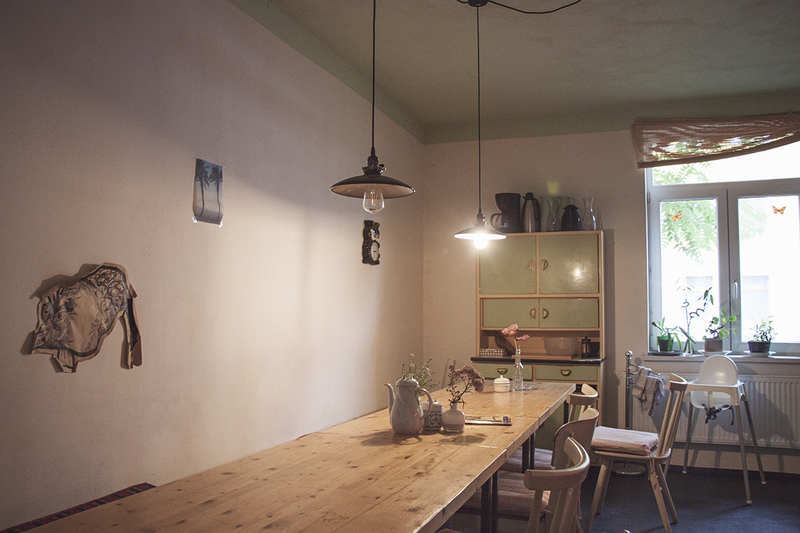 Nice cozy vegetarian and vegan café also located in Lindenau with several vegan options on the menu. Beware that the portions are huge here also, so I’d recommend sharing something with a friend if you are not so hungry. 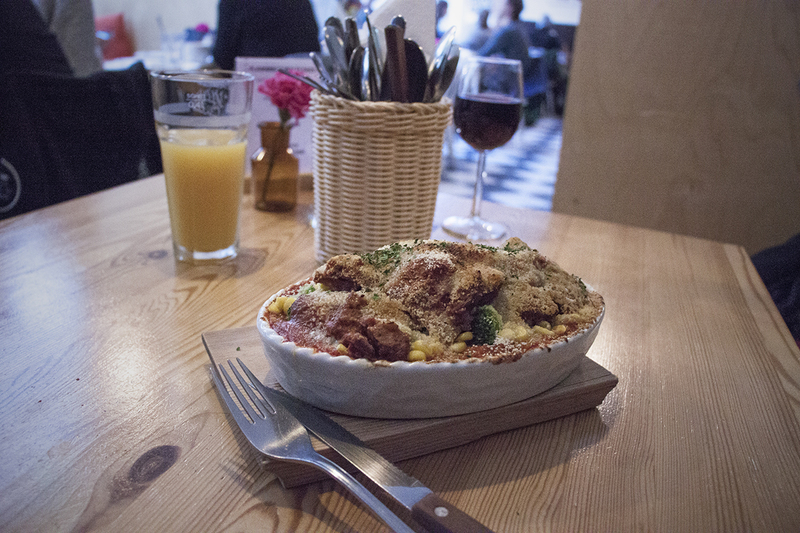 All sorts of homey stuff is on the menu here, such as this lovely hearty couscous casserole, as well as cakes, salads, burgers, soups and delicious coffee and shakes. This place can also get busy, so come early or be ready to wait. It’s worth it though! Lindenau might seem a little bit out of the way when you look at a map of Leipzig, but trust me when I say you do not want to be in the uber-touristy center of town for an extended period of time. For that, a day trip on the tram will more than likely suffice. Lindenau is the place where I stayed and spent most of my time in Leipzig. It has a much more “local” vibe, tons of nice restaurants, cafes, bars, and galleries, as well as several lovely hostels such as Hostel & Garten Eden, where we stayed during our trip. 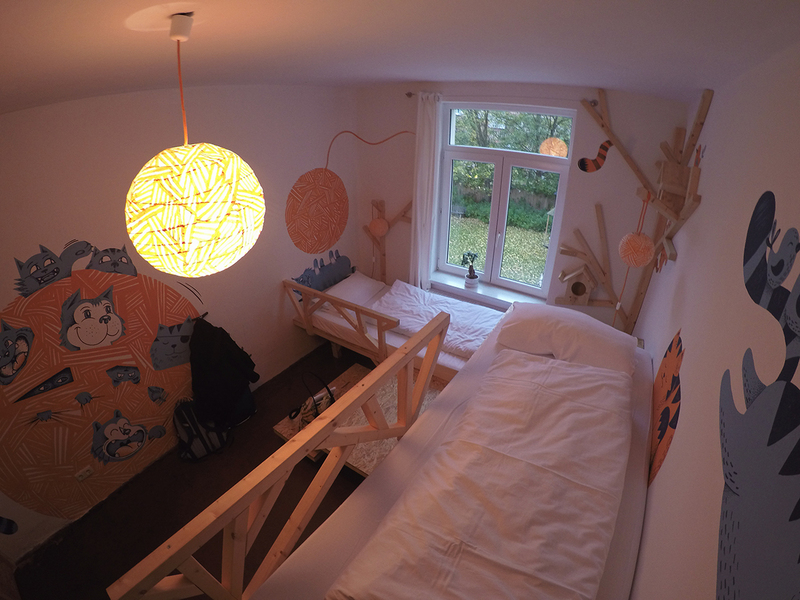 Our private double room was one of the cutest room I’ve ever stayed in, with cat-themed decoration hand-painted by a local artist and super comfy platform beds. 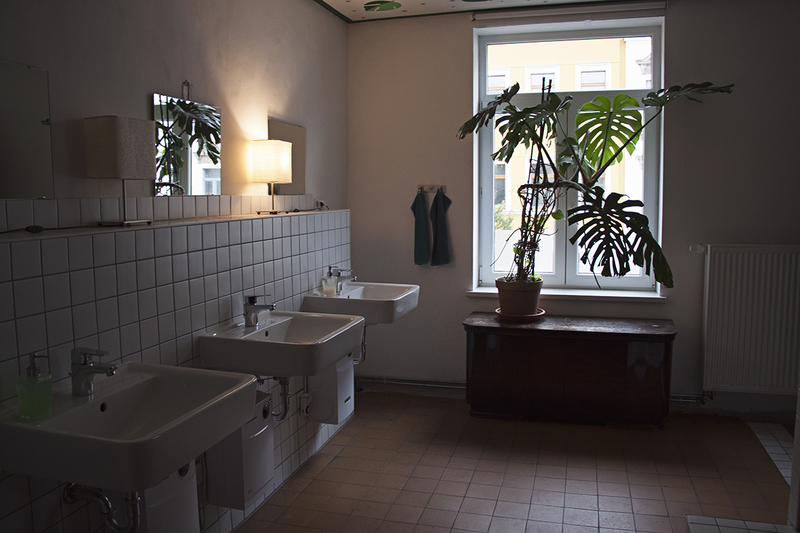 Shared bathrooms are also great. The whole hostel is super ecletic and nicely designed, and the common areas and garden are great, albeit I was there in the wrong season to actually be able to enjoy the garden! To top all this up, I found the staff to be so sweet, getting out of their way to make sure we were always comfortable and happy. Heartfelt thanks to Leipzig Tourism and Marketing and Hostel & Garten Eden for their hospitality. All opinions are my own, obvs. 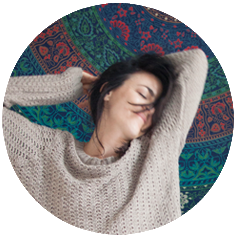 This entry was posted in 2vegans1country, Europe, Germany, Veganism on January 15, 2018 by Amélie. Deli in connewtiz is definitely missing on your list ! Vegele ist geschlossen …. gibt es nicht mehr, das GreenSoul fehlt noch !! !